Anaemia is a common problem with myeloma due to a reduction in the number of red blood cells. This leads to a feeling of weakness, lack of energy and continuing tiredness. The bone marrow and its capacity to produce red blood cells can recover with myeloma treatment, so the anaemia does not always need to be treated itself. If it does need treatment, you can be given a blood transfusion to restore the level of red blood cells quickly. Alternatively, erythropoietin (EPO) can be given to stimulate production of more red blood cells. Sometimes you may have a sore mouth from chemotherapy, or simply don’t feel like eating and a meal replacement drink may be useful. It can be easier to eat smaller meals, more often than usual, and take a larger meal when you feel able to. Avoid fatty or fried foods and those which are very sweet or spicy. It is important to keep drinking water or other drinks – milk, squash, decaffeinated tea or coffee, ideally up to three litres (five pints) each day, or ordinary tea or coffee in moderation. If these approaches don’t really help, you can ask to be referred to a dietician who can recommend some more alternatives. The presence of a large amount of paraprotein in the blood of myeloma patients can cause it to thicken (it becomes hyperviscous). This can slow down the passage of blood to the brain and cause dizziness, confusion or even symptoms similar to those of a stroke. You or someone near you should call for medical help if these symptoms occur. It can be treated quickly by a technique called plasmapheresis, which takes blood from a vein and separates the blood cells from the liquid (plasma) component containing the paraprotein, which is discarded. The blood cells are mixed with replacement plasma from a donor and returned to your blood system. Myeloma can also increase your risk of a blood clot (which could present a risk of deep vein thrombosis or pulmonary embolism), especially if you are taking thalidomide or lenalidomide (Revlimid) in combination with high-dose steroids or chemotherapy drugs. You will be assessed for your risk if you are starting on thalidomide or lenalidomide, or if you need to go into hospital, and treated if necessary with an anticoagulant like warfarin or fondaparinux. This can arise as a result of too high a level of calcium in the blood, from the breakdown of bone. It can also be a side-effect of treatment with thalidomide or bortezomib, or it could be linked with compression of the spinal cord due to bone damage in the vertebrae. It is important to take advice, to find out the cause. Don’t be afraid or embarrassed about telling your doctor about constipation, as they are quite used to this sort of problem and will be able to help resolve what can be a distressing problem with a big impact on your quality of life. It is much easier to prevent constipation occurring than to treat it, so it is a good idea to make sure that your diet includes some foods which are high in fibre, e.g. bran, wholegrain bread, fruit, vegetables and especially beans or lentils. Cake and white bread should be kept to a minimum; also sugar-rich foods in general. It is also important to make sure that you don’t become dehydrated, and most people need to drink between 2-3 litres of water every day. That sounds a lot, but it includes water in tea and coffee. There are also a number of natural remedies which may help, including seeds, syrup of figs and bran husks, but it is advisable to check with your doctor in case of any interaction with your medication. Finally, gentle exercise like walking, swimming or cycling should be a regular part of your routine. If constipation becomes a big problem, your doctor can prescribe several types of laxative, which either reduce the removal of water from the faeces in the intestine, making them softer, or increase their bulk, or stimulate the movement of the bowel. Diarrhoea is considered as episodes of passing loose or watery bowel motions more than three times a day. It can be accompanied by headache, stomach cramps and loss of appetite or even nausea and vomiting. Some anti-myeloma drugs e.g. bortezomib (Velcade) can cause diarrhoea, or it can result from an unrelated infection. Diarrhoea can also arise if you have AL amyloidosis as well as myeloma. AL amyloidosis is a disorder which involves production of an abnormal protein (amyloid) in the bone marrow. AL amyloidosis can occur as a separate condition but can also be identified after a diagnosis of myeloma. It results in an excessive production of light chains (see sections 2.1 and 2.2), which become bound together into fibrils within the tissues and organs, disrupting the way they work and giving rise to symptoms including diarrhoea. Whatever the cause of your diarrhoea, you should report it to your doctor or nurse so the most appropriate treatment can be prescribed. There are also several things you can do yourself which will help. You should make sure to drink plenty of water or diluted fruit juice and avoid tea and coffee. Keep to small, light meals including chicken, eggs and white fish, and avoid spicy foods. Some people with myeloma suffer from difficulty in swallowing solids, liquids or both, which is known as dysphagia. This may be associated with coughing or choking while eating or drinking. The cause is not quite clear but may be related to the blood viscosity being raised because of the paraprotein it is carrying. The chance of dysphagia also seems to increase after receiving a stem cell transplant. Treatment depends on the symptoms experienced, but avoiding meat (which can be hard to swallow) may help, and also therapy can help to reduce the chance of choking. Myeloma is characterised by excess light chain production and a high level of blood calcium; both of which can damage the kidneys. Acute kidney failure (known as myeloma kidney or cast nephropathy) is often the first symptom of myeloma, which can sometimes severely reduce the kidney’s capacity before detection. It is caused by the excess light chains blocking the kidney tubules, causing them to fail in their function of removing waste substances from the blood. Chronic kidney failure develops over a longer period (weeks or months) and is shown by the presence of light chains in the urine and a rise in creatinine in the blood. It is caused either by cast nephropathy, or by deposition of amyloid protein in patients with amyloidosis. The urine shows a high level of albumin, and the blood has a very low level. Fluid retention follows, causing swelling in the legs, ankles or feet. Renal failure is usually treated by dialysis and about 20% of myeloma patients need this treatment. Kidney transplantation is not usually available to myeloma patients. It is important in treatment of myeloma to prevent the occurrence of kidney failure rather than to treat it, and useful guidance is to avoid dehydration (to keep the kidneys actively functioning) and to avoid non-steroidal anti-inflammatory drugs (e.g. ibuprofen). Bisphosphonates (especially zoledronic acid and pamidronate disodium) should be used with caution as these can make kidney problems worse. 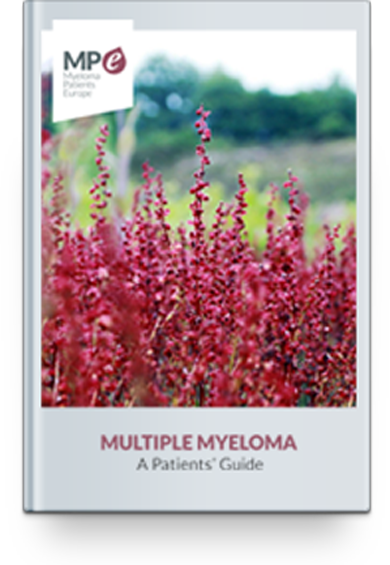 Fatigue is a very common symptom of both myeloma and its treatment. It is often made worse by anaemia. Your tiredness can make even routine tasks feel too difficult to attempt, but a number of approaches can help. It’s important to get enough sleep, so try to make a routine of going to bed and getting up at the same time, and take a rest in the daytime when you need to. Gentle exercise can help by improving your appetite and your energy level. When you need to do particular tasks, spread them out in time and don’t try to do everything at once; focus on whatever is most important or urgent. Accept offers of help from your family and friends – as well as helping you, this will make them feel that they are really being useful. If you are working, investigate whether you could work from home or reduce your hours or responsibilities. Most chemotherapy drugs used in treating myeloma cause hair thinning rather than complete loss, which is mainly related to the intensive chemotherapy given before a stem cell transplant. It happens because the chemotherapy drugs attack all the cells in the body which are rapidly dividing, and among these are the hair follicles. Hair loss can be distressing, but the hair will grow back within a few months after the treatment is completed. Your new hair may be finer than before, or more curly, or a slightly different colour. Having your hair cut short before you start to lose it through chemotherapy can work well, as you can feel more of a sense of control while it is thinning and growing back. Otherwise, today’s wigs are very natural-looking, or you could use a scarf – and many people choose not to cover their heads at all. It’s entirely a matter of what feels right for you. If you are hoping to have children in the future, you need to know that some myeloma treatments can affect fertility by affecting the function of the ovaries or of sperm production, and to take advice from your doctor. This infertility is often temporary, but could be permanent depending on which drugs you are given. Those most likely to affect fertility are cyclophosphamide and melphalan, and permanent infertility is more likely with higher doses, like those given just before a stem cell transplant. Infertility can also arise from radiotherapy of the pelvic area. If this is important for you, your doctor can refer you to a fertility specialist to discuss what can be done. It may be possible to undergo sperm or egg collection for later use, and fertility counsellors can provide supportive advice. A high level of calcium in the blood (hypercalcaemia), side-effects from chemotherapy drugs and also unrelated infections can all give rise to nausea and vomiting. While very unpleasant symptoms, they can be treated. If they are a side-effect from the drugs, e.g. bortezomib (Velcade), they can be treated with anti-emetics. If infection is the cause, antibiotics may be needed. Hypercalcaemia is more serious as an excess of calcium in the blood can cause kidney damage, and this is treated with intravenous fluids and anti-myeloma drugs. As well as drug treatment, it can be helpful to eat small, frequent meals and to avoid food that is fatty, spicy or has a strong smell. If you have a relatively low level of white blood cells (neutrophils) in your blood, which can happen especially after chemotherapy, you could be at greater risk than normal of food poisoning caused by bacterial or fungal contamination. The shortage of neutrophils, which would normally counteract these agents, is called neutropaenia. The risk is also increased because the lining of the gut can be damaged by chemotherapy and radiotherapy, which makes it easier for bacteria in food to enter the bloodstream. If you develop neutropaenia, you will be given detailed advice by your doctor or dietician on which foods to avoid and which are good alternatives. The strictness of this advice depends on your level of neutrophils. You may need to continue following this guidance even after your neutrophil count has recovered, as you may still be at a higher risk of infection. The main foods to avoid are unpasteurised dairy products (like farm-fresh milk); soft or blue cheeses; raw or lightly cooked shellfish; raw, undercooked or smoked meat, poultry or fish; raw or undercooked eggs or foods that contain them, like sauces or ice-cream; foods, drinks and supplements described as ‘probiotic’ or ‘bio’, and meat or vegetable pates. You will also need to follow a high level of food safety hygiene practices in everything related to your food – shopping, food preparation and storage. There are many points to take into account, and you will be given detailed guidance, but for example: avoid buying food with damaged packaging and avoid large packets that will be open for longer and increase the chance of contamination. Always store raw and cooked foods separately and make sure that frozen food is defrosted covered and at the bottom of the fridge (rather than at room temperature), to avoid it dripping onto other food. Cook all food thoroughly until it is piping hot all through and meat juices run clear. Take care with hand hygiene: always washing hands before preparing food and after touching your hair, pets, rubbish, dirty laundry and visiting the toilet. Keep a separate chopping board for raw meat or fish and do not use it for other foods. You should also tell your doctor if you are feeling more bone pain than can be controlled by your painkillers – there are alternatives and you should not feel that you have to put up with it. Be especially aware of increased or sudden back pain, or tingling or loss of sensation in your legs, and tell your doctor. It may help to keep a record or diary of how you are feeling so you can describe it clearly at your next visit or if you contact an out-of-hours doctor. Peripheral neuropathy means damage to the peripheral nervous system, which means all the nerves in the body except the brain and spinal cord. These nerves communicate between the brain and the other parts of the body and are composed of two types of specialised cells: motor neurons and sensory neurons. The motor neurons carry electrical impulses from the brain to the muscles and enable them to carry out movement by contracting or relaxing. The sensory neurons carry information about the sensations of pain and touch to the brain from all external parts of the body. When these sensory neurons are damaged in peripheral neuropathy, the sensory messages can be distorted or interrupted, which the brain interprets as tingling, numbness, altered sensation, increased sensitivity to touch, or pain. The sensations are most often felt in the hands and feet. Peripheral neuropathy is present in a small proportion of patients when they are diagnosed with myeloma, but about four out of five will develop its symptoms to some extent later; either through myeloma itself through deposits of paraprotein in the nerve cells, or as a side-effect of treatment. Thalidomide, bortezomib (Velcade) and vincristine can all contribute to peripheral nerve damage. The treatment for peripheral neuropathy depends on what has caused it. If it is caused by myeloma, then the myeloma treatments themselves should reduce the neuropathy. If it has arisen as a side-effect, then the treatment concerned can be stopped or given at a reduced dose. If it is a side-effect of bortezomib (Velcade), it may be sufficient to change from intravenous to subcutaneous administration (injection into the skin rather than into a vein). Thalidomide and bortezomib (Velcade) can result in a rash and dry, itchy skin rashes, or more rarely, thalidomide can cause a more serious rash with blistering. If this happens, the medication should be reduced or withdrawn. It is worth also being aware of shingles, which is a viral infection to which myeloma patients are more susceptible than other people. Shingles is an infection of a nerve and the skin around it, and causes an itchy, painful rash that is normally on one side of the body; on the chest, abdomen or face. The rash forms blisters which eventually burst and crust over. Shingles can be treated by antiviral tablets (aciclovir, valaciclovir or famciclovir), which work best if started in the early stages. Calamine lotion will relieve itching and has a cooling effect, or a cloth soaked in cold water will soothe the blistered skin but should be stopped once the blisters have stopped oozing. Myeloma bone disease involves the breakdown of bone more quickly than it can be repaired. If this happens in the spine or ribs, even minor pressure can cause the bone to fracture. A break in one or more spinal vertebrae can cause the vertebrae to collapse and is sometimes the cause of compression of the spinal cord and loss of height. The symptoms of spinal cord compression are sudden back pain and loss of sensation in the legs, and it may also involve incontinence, inability to pass urine, or constipation. Urgent treatment is needed, and one of two surgical procedures may be needed. In percutaneous vertebroplasty, a type of bone cement is injected into the vertebra, which stabilises the joint and reduces pain. The other, known as balloon kyphoplasty, involves inserting a small inflatable balloon into the vertebra before the cement is injected. In some cases this can also restore height and correct any spine curvature, as well as relieving the pain. The production of abnormal plasma cells in the bone marrow leads to a lower production of other blood cells, including blood platelets. These are involved in blood clotting, so if you have a relatively low level of platelets in your blood, you can be more prone to bleeding or bruising. It can also occur as a side-effect of myeloma treatments, including thalidomide, bortezomib (Velcade), lenalidomide (Revlimid), cyclophosphamide and melphalan. The condition is known as thrombocytopaenia, and it may give no symptoms at all, or spontaneous bleeding from the gums or nose, extended bleeding from cuts, excessive bruising or a red rash of tiny pinpoint marks, commonly in the lower legs. Your regular total blood count (see section 3.3.1) will monitor any changes in the level of blood platelets. The condition will improve gradually as a result of your myeloma treatment, and the bone marrow will become better able to produce platelets. If the thrombocytopaenia is a side-effect of treatment, it may be necessary to reduce the dose or delay treatment until your platelet level recovers. You should keep a watch for any unusual bleeding and report it to your doctor. It is also a good idea to avoid anything that could give rise to bleeding or bruising, and to use a soft toothbrush to avoid damaging your gums. Limiting alcohol intake is helpful, as alcohol tends to reduce the platelet level and ‘thin’ the blood. If you see blood in urine, stools or vomit, this should be reported immediately.